In today’s corporate world, capturing the interest of channel partners is anything but easy. The b2b landscape is saturated with competition and market modification, which mandates the need for your “partner pitch” to truly stand out with a mouthwatering appeal. 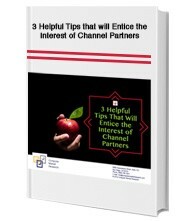 Fill out the form on the right to download your free copy of “3 Helpful Tips that will Entice the interest of Channel Partners”.